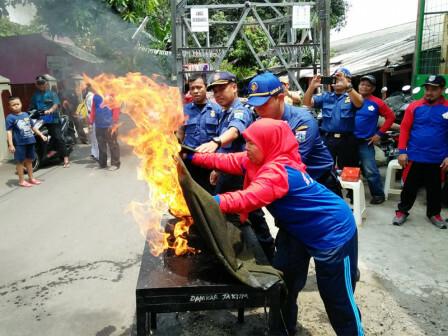 40 residents living in RW 12 Kelapadua Wetan Urban Village, Ciracas, East Jakarta are undergoing fire training today, Monday (11/5).
" It is hoped that residents will become more aware of the dangers of fire"
Muchtar Zakaria, Acting Head of East Jakarta Fire and Rescue Sub-dept. stated that fire training is held for people resilience towards fire prevention. In this region, there have been three cases of fire. "It is hoped that residents will become more aware of the dangers of fire. This is an effort to minimize the occurrence of fire cases," he stated. During the training, participants were educated about the dangers of fire, either in theories or fire prevention practices. It is like when gas leaks occur, they must turn off electricity, lighting candles, matches, etc. Most participants were cadres of PKK, Jumantik (wiggler hunter), integrated health post (Posyandu), RT/RW apparatuses, LMK apparatuses and so on. Hopefully, they could socialize it to other residents during Jumat Keliling (Jumling) program that is an effort to get closer to the community or mosquito nest eradication (PSN). "They must be brave in handling fire cases. If they just wait for the firefighter, the fire will be large and many objects will catch fire," he expressed. Meanwhile, RW 12 Kelapadua Wetan Chairman, Sunardi admitted the activity has been held thrice this year. "Similar activity will be intensified to other residents during Jumling, PSN and other citizen activities. Thus this knowledge will spread to other residents who cannot attend the training," he uttered.